January 26th is Australia Day. On this day, the entire country listens to "Land Down Under" by Men at Work on repeat for the whole day. OK, maybe that's not how all Australians celebrate the official national day of Australia. That may not be how any Australians celebrate the day. Perhaps only myself and J.D. from Scrubs would celebrate that way. I'm pretty sure they're not throwing any shrimps on any barbies either. They don't even call shrimp shrimp. They're prawns there. There's also probably some playing with their didgeridoos (it's a musical instrument). Australians are much better than me at coming up with great celebrations to honor the foundation of their country. On the 26th there are outdoor concerts, barbecues (so maybe they do throw some prawns on there), sports competitions, festivals and fireworks. There are also ferry races and tall ship races in the harbor. There is also an Australian of the Year presentation that apparently isn't just a fight between Russell Crowe and Hugh Jackman every year...but it should be. 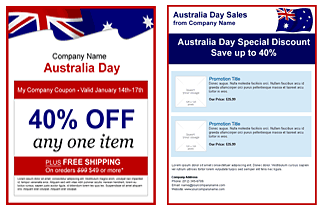 Wish your Australian subscribers a happy Australia Day with a Benchmark Australia Day email template. I suggest recording your personal cover of “Land Down Under” and sending it out to your list. Everyone should get a kick out of that. I know I would.